Fatal Frame has always been a series that eluded me, spare the few hours I spent with Crimson Butterfly on the PS2 on a weekend video-store rental. The concept was always fascinating; you take on your aggressors, rather than run and hide, equipped with a camera that can see the ethereal and photograph their essence away. I’ve often expressed my distaste for horror games that rely on you memorizing patrol routes and hiding in corners – the suggested and anticipated is much more intriguing than the reliable and rote, and it’s more frightening to have your agency taken away than to have no agency to begin with. Black Water sets itself apart from pretty much every other Fatal Frame in the use of the Wii U’s GamePad. Instead of playing like a pseudo-first-person-shooter, you hold up the GamePad and it acts as your Camera Obscura, with the giant screen as your viewfinder. The level of interactivity this adds to the experience is incredible, and it’s a match made in Nintendo-heaven. Ghost fights feel frantic and chaotic as you snap up the camera, try to get off a few shots and then drop it again to run away and make some distance. The atmosphere this game builds is some of the best around. After testing it out with the sensor bar in a variety of locations and varying distances between myself and the TV, I can say that this will work with just about any entertainment center configuration due to one simple fact: when you hit the X button to go into camera mode, the game assumes you have centered the GamePad in front of you and adjusts accordingly. It sounds a little odd, but this made it so that I never had to fuss with where I was sitting, or my position with the sensor bar. An early boss fight highlights why the addition of the GamePad feels so right for Fatal Frame. Three ghosts of playful children, who had been watching me throughout the level, decided to impede my progress at the climax of the mission. Their method of attack was to run circles around me, disorienting my aim with the camera, and I had to wait until one tripped in order to demolish them with pictures. The feeling of being spun in circles was heightened by my frantic real-world torso rotations, trying to spot the children and interrupt their attacks while waiting for one to trip up. Besides just an excellent ab workout (thanks, Nintendo! ), it put me in my protagonist’s shoes, building up that tension of having a pack of ravenous ghoul-children deftly circling you and nipping away at your health. Snapping a photo at the right time lets you glimpse the past with your Camera Obscura. While the camera controls are fantastic, the rest of the game hits some hitches in the controls of the protagonists. A strange version of tank controls rears its ugly head, and the controlled player character often feels unwieldy at best, meaning a lot of bumping into scenery and difficulty in turning corners. It builds some tension, sure, but it gets really annoying when you want to turn around and have to spend the better part of half a minute just making that happen. The story falls under standard Fatal Frame fare, but that’s in no way a sleight to it. The three protagonists all find themselves chasing the same haunt – the titular maiden, whose participation in a botched ritual meant to appease the mountain’s vengeful spirit ends up trapping her in a violent, eternal existence as the Maiden of Black Water. Yuri searches for her missing mentor, whose disappearance might be linked to the maiden; Ren seeks the truth of his recurring nightmares, potentially linked to the botched sacrifice; and Miu, whose mother has gone missing, is presumably somewhere on Mt. Hikami. Each character has their own ending, with several options based on choices you’ve made – a nice touch that makes this game feel more like a scattered series of vignettes that interlace rather than a flat, single-path story. You’ll feel compelled to follow each character to their happy – or unhappy, depending on your outlook – end, and each story is interesting enough that no one protagonist feels swept under the rug. The protagonists’ stories intersect often, but each has their own motivation for going to the mountain. Mission structure can become tedious, though, as you’ll often find yourself backtracking to previous areas to pick up a key or item just to run all the way back. It feels artificial at times, but there’s usually a twist or something new to do that keeps the re-treading fresh. Locales often repeat themselves, but the situation often changes – Mt. Hikami is a big place with a lot of nasty ghoulies, and there’s a nice variety of them to keep you busy as you trek across the mountain. Ghosts and ghouls abound, but I was surprised at the lack of actual frights I experienced. In full disclosure, I’m what you’d call a “weenie” when it comes to jumpscares. My favorite parts of The Ring were seeing flashes of something scary between my barely-open fingers covering my eyes. There’s not a whole lot of that in this game, which I enjoyed, as the horror lingers much more. Maiden of Black Water is content to build foreboding atmosphere and tension, and lets the panic take place in the photo-op fights rather than just popping up something scary for a cheap thrill. The move to Wii U allows Fatal Frame to not just incorporate interesting gameplay and atmosphere, but also some great fidelity in the graphics department. The use of artificial film grain can be a bit much at times, but for the most part, this is a surprisingly gorgeous game. That’s in part due to Koei Tecmo, as this game runs on the Dead or Alive 5 engine, and that leads to a strange issue I had with this game. Ayane from DOA is in the game, in an odd but interesting Easter egg mission. Water is a key mechanic in the game, with many of the ghosts and the main antagonist all employing water and drowning in some method. I love the idea thematically, as it leads to some amazing moments near the end of the game, but it also means that many characters are often wearing white and getting doused in water. I thought it just an odd coincidence, but after chapters of this happening (and really only to female characters), mixed with some of the more “alluring” unlockable costumes for the two female protagonists… it felt voyeuristic, an odd criticism for a game about snapping photos against someone’s will, but at least the ghosts aren’t wearing wet T-shirts and lingerie. That’s a mild criticism, though, in an otherwise excellent addition to the Wii U’s library. I found myself frequently wishing that this game came earlier in the Wii U’s life cycle, because it makes such excellent use of the GamePad in a way that would be impossible on other platforms. 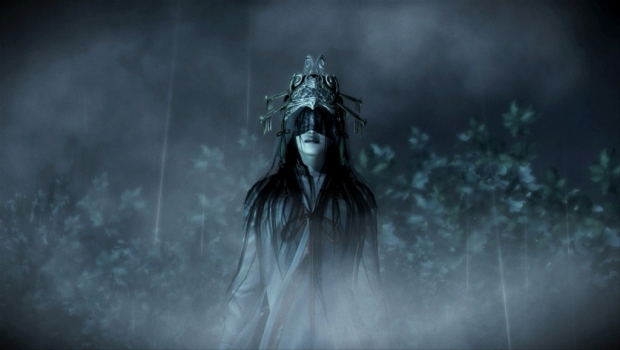 Fatal Frame: Maiden of Black Water executes brilliantly in the use of the Camera Obscura, and combined with a creepy plot and some great atmospheric tension, there’s no reason a horror buff should miss out on this if you’re looking for an innovative new fright. Fatal Frame: Maiden of Black Water finds a wildly effective new way to utilize the GamePad as the Camera Obscura, and builds some great story and atmosphere. Barring an odd control scheme and some tedious missions, this is a stellar horror title for any Wii U owner.